Here at Taylor Custom Rings, we have crafted many beautiful rings both with diamonds and with other stunning precious stones. To give you some ideas as you plan your custom engagement ring, we have created a list of the 10 most dazzling and unique diamond alternatives for your engagement ring. Among the diamond stimulants, moissanite is the hardest with a 9.25 on the Mohs hardness scale. For reference, diamonds are rated a 10 on the Mohs. Another bonus of moissanite as a diamond alternative, these stones are significantly more budget-friendly than diamonds. 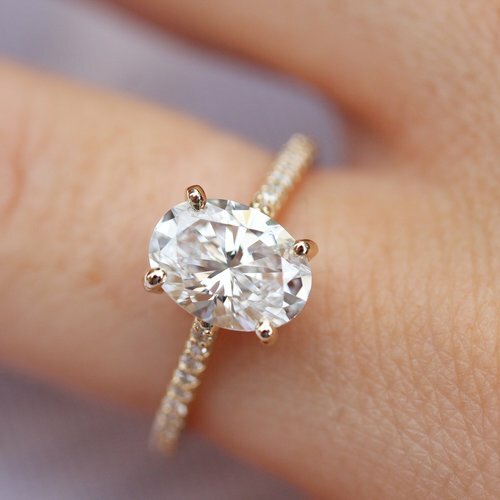 While the clear/white moissanite stones are not the most unique alternative to diamonds, Taylor Custom Rings can find you colored moissanite to really give your engagement ring an original flair. Opals are eye-catching stones thanks to their sparkling refraction. They are low on the Mohs scale, ranging between 5.5-6.5 depending on the type of opal you choose. This does mean the opal will be in greater danger of chipping and/or staining. There are many opal color variants so you can find the right style and color of opal for your engagement ring. The classic sapphire is a deep blue stone but you can find sapphires in other colors, such as yellow, white, peach, green, pink, and more. Sapphires are a 9 on the Mohs scale, making it a fairly durable stone choice for your engagement ring. Pearls as a center stone in a ring make a lovely and timeless statement. However, they are very porous and only have a 2.5 to 4.5 on the Mohs hardness scale. So, if you would like to use pearls in any part of your ring design, be aware that rings featuring these stones will stain over time and are more prone to chipping. It can also be difficult to secure pearls in a ring setting. Working with an experienced custom jewelry designer like Jerry Taylor is vital to making sure your pearl ring is stable and secure. Instead of going the traditional route of a mined diamond, consider the more affordable and sustainable route of lab-grown diamonds. The difference is utterly undetectable to even the trained eye. You can give her the brilliance and shine of a diamond for less cost. Rubies are another precious stone which rate a 9 on the Mohs scale. These brilliant stones can make a vibrant statement in any engagement ring. Not all rubies have a deep red vibrancy, so as you plan out your ring, be sure you specify the color you are looking for in your ruby. 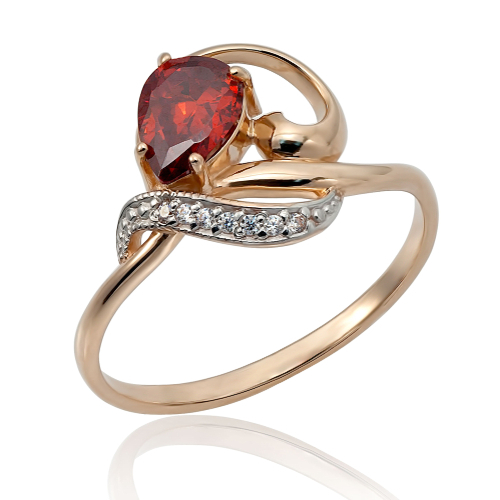 You can find garnets in a variety of colors but most often people will recognize garnets as a deep, ruby-like red. These stones are often deeper in color than rubies but tend to not sparkle as brightly. Garnets are not as hard as rubies as they rank 6.5-7.5 on the Mohs scale. 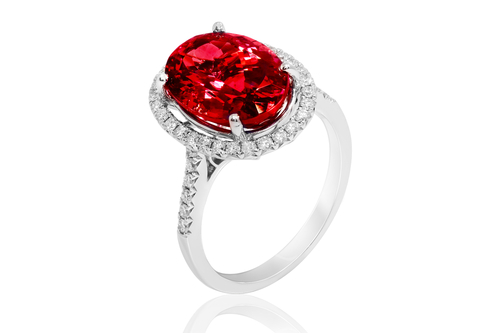 However, they are less expensive than rubies and make a great option for ring creators on a budget. Light blue and sparking, an aquamarine makes an attractive addition to any engagement ring. Aquamarines are a fairly strong stone for a semi-precious stone, with a Mohs rating of 7.5-8. These stones are exceptionally clear which gives them a bright appearance which is well complemented by a halo of white stones such as diamonds or moissanite. Emeralds are another tough precious stone, rating a 7.5-8 on the Mohs scale. These deep colored and classic stones look their best in a more antique-style ring setting. 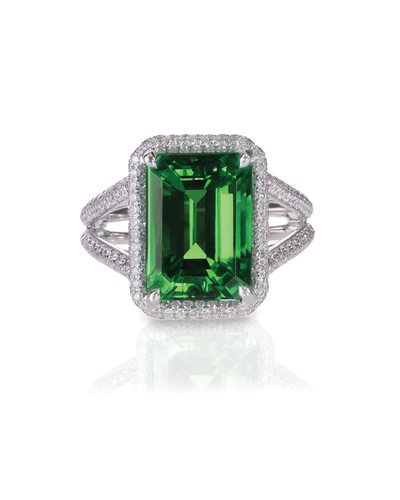 While they are often seeing in more rectangular emerald or cushion cuts, you can find emerald stones in most stone cuts. Found in various shades, from foggy white to shimmering rainbow, moonstones are a unique addition to any engagement ring design. They have a Mohs hardness of 6-6.5, so you will need to be careful with these stones. 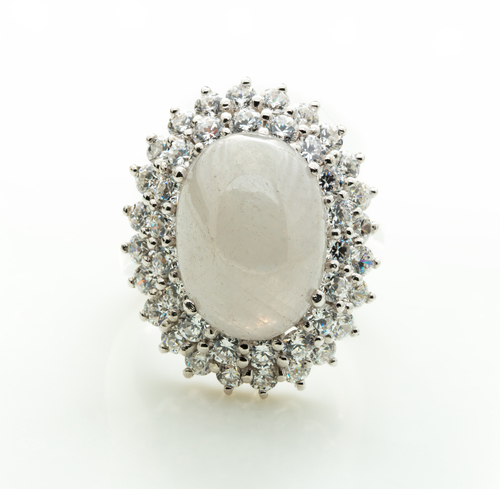 Also, if you choose to use moonstones in your engagement ring, you may want to add stones with sparkle to set your ring apart from a more average ring. No matter what kind of stone you want to use in your custom engagement ring, Taylor Custom Rings will do their best to accommodate your design. We will advise you concerning the strength and position of your stones but ultimately, we will do all we can to make your dream ring come to life.